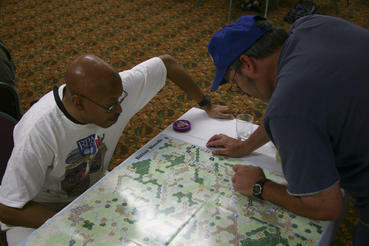 Alan Hayes and James Tracy during the Grognard pre-con outside the tournament. Tom Gregorio (left) and Ed Witkowski enjoy their tournament match. Twenty-one gamers participated in this year's tournament. The scenario to be played was determined by a random die roll. There were 15 U.S. and 10 German victories recorded. Most players opted to select sides via random die roll, so the distribution of sides was primarily random. 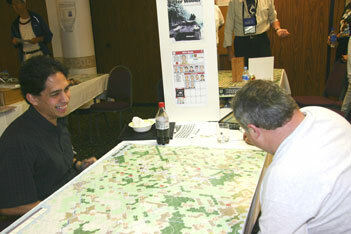 Newcomer, Ed Witkowski, proved to be this year's wild card by defeating seasoned player, Marty Musella, as the Germans. Johnny Hasay nearly pulled off a big upset on the last game-turn of the eight turn tournament scenario vs Randy Heller by placing Fuh. Es. in reserve to capture Spa during the mechanized exploitation phase. Alas, his die rolls would not cooperate. Throughout play, several gamers chose to make some bold moves with their KG Peiper breakout move, resulting in the destruction of this powerful unit in no less than a record four games played. Past champs, Tom Gregorio and designer, Randy Heller, squared off in the final round, with Tom taking the Americans in the eight turn tournament scenario. Choice of sides and scenario were again determined by random die rolls. Randy's Germans fell flat on the opening turn, with no built bridges, surrounded enemy units, engagements, or significant advances. Rocherath-Krinkelt, Hofen, Schonberg, and Vianden remained in American control. By Turn 3, the Germans had recovered to a large degree. A key Angriff attack along the Beho-Gouvy road net trapped two full strength American units. On the 17 AM urn, Tom was confronted with a 2-1 (-1) attack in front of Stavelot and a 3-1 (-1) attack on Malmedy. The latter had the potential of trapping several of Tom's units NE of Malmedy. Once again, Randy's die rolls fell flat. Tom responded with a series of aggressive counterattacks in the north, resulting in the destruction of no less than six German infantry units. In the south, Bastogne was threatened by mid-game. Although a fortification could not be built due to the proximity of German units, Tom was able to retain possession of the town with the aid of the Middleton leader unit. The climax of the game came with the opportunity to capture Parker's Crossroads on the 18th of December. Randy needed either a 2-1 (-1) at the Salmchateau bridge or a 3-1 (-1) on a surrounded unit at Gouvy to result in a defender retreat to open up a road net for mechanized exploitation. Once again his die rolls failed to cooperate. The Germans did succeed in capturing the victory point town of Trois Points, but only eliminated nine American units. In a valiant and successful effort, Tom Gregorio forced Randy to throw in the towel on 19 AM, returning the Bitter Woods crown to the former champ. SINIGAGLIO WINS BITTER WOODS PBeM TITLE: The fifth BPA Bitter Woods PBeM tournament got underway on December 16th, 2006 to commemorate the battle with 32 players and has ended five rounds later with Bruno Sinigaglio's GI's defeating son Buddy's Germans to claim his first title. The Americans won 20 of the 31 games played, including six of the last seven. Other laurelists in order were Bill Morse, Steve Likevich, Jeff Lange and Frank Sinigaglio.